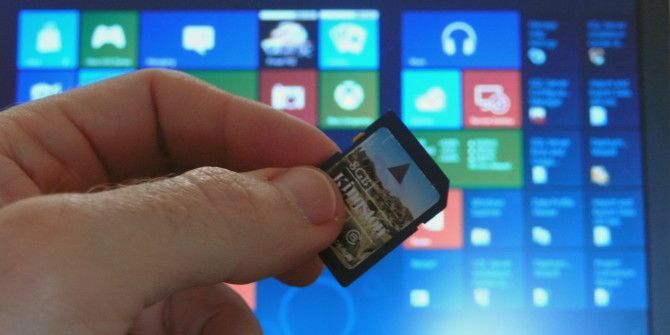 Windows 8.1 devices are all full PCs — yes, even the tablets — and often support SD cards 7 Awesome Uses for an Old SD Card 7 Awesome Uses for an Old SD Card Whether your old SD card is a meager 64 MB or a massive 64 GB, various projects exist for you to make use of these storage cards. Read More . This allows you to easily expand your PC’s storage. Just insert an SD card and you can treat it as a “permanent” part of your device. 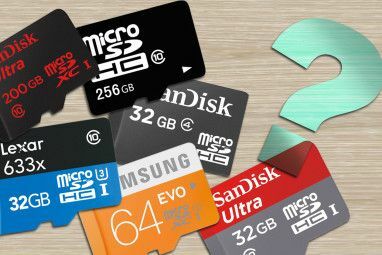 The SD card will likely be slower than your device’s built-in storage, but it’s a great way to store music, videos, pictures, and other files. The original release of Windows 8 didn’t have very good support for SD cards. 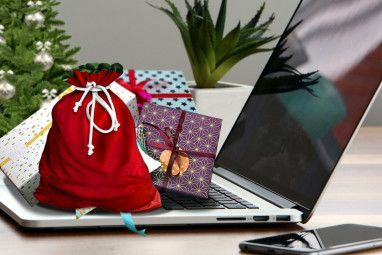 You couldn’t easily access them from Windows 8-style apps without going through some obscure tricks on the desktop. This has changed with the Windows 8.1 upgrade How To Upgrade To Windows 8.1 & How To Downgrade Back To Windows 8 How To Upgrade To Windows 8.1 & How To Downgrade Back To Windows 8 The Windows 8.1 update is free, easy, and gives you access to new and improved features. It is, however, impossible to simply downgrade to Windows 8, unless you plan to before updating. Let us show... Read More , which offers much improved support for SD and micro-SD cards. To get started, pick up an SD card or micro-SD card. Be sure to get one that your device supports, as some devices may only support smaller micro-SD cards and not the larger SD cards. After you insert the SD card, it will appear as another drive with its own drive letter. You can use it normally from desktop applications and the File Explorer window. If you’re using Windows 8-style apps, you’ll need to do some more tweaking. The new PC settings app allows you to easily set a removable drive as your default save location for pictures, music, and videos. This is the easiest way to set up an SD card as the main location for your media files, but it’s limited. For example, you can’t set it as your default documents folder here. To do this, press Windows Key + I and click Change PC settings. Select PC & Devices, select Devices, and then scroll down until you see the Default save locations section. Click the Setup button and select the removable drive you want to use as your default save location. This creates Music, Pictures, and Videos folders on your SD card. Windows then adds these folders to your Music, Pictures, and Videos libraries and sets them as the default save location. Your default save locations are used both from Windows 8-style apps and when saving a file to a library from a desktop application. Note that this won’t move any existing music, pictures, or videos to your SD card. You’ll have to do that manually, if you want to — check the next section for more information. Windows 8-style apps use libraries. For example, a music app gets its music from the Music library, while a photo-editing application accesses its images from the Pictures library. To manage where Windows stores such files used by Windows 8-style apps, you’ll have to manage your libraries. Read our overview of the Windows libraries feature Make Windows 7 & 8 Libraries Work For You Make Windows 7 & 8 Libraries Work For You Libraries, found in Windows 7 and 8. are more than a list of suggested folders for saving documents, music, pictures, and video. Customizing your libraries isn’t just tweaking for the sake of tweaking – with... Read More for more information about how they work. Confusingly, Microsoft has hidden the libraries by default in Windows 8.1, even though they’re required by Windows 8-style apps and now work properly with SD cards. To access libraries, open the File Explorer on the desktop, click the View tab on the ribbon, select Navigation pane, and select Show libraries. Select a library and you’ll see the folders inside it. If you made an SD Card your default save location earlier, you’ll see a folder on the SD card and a folder on your computer. You can move folders between the computer and the SD card from here using cut and paste. To modify your libraries — for example, perhaps you want to use the SD card as your default save location for documents — right-click a library and select Properties. You’ll be able to add and remove folders from the library, in addition to choosing which folder is your default save location. Unlike on Windows 8 and previous versions of Windows, you can easily add folders from a removable drive to your libraries without using third-party programs for managing your libraries 2 Tools and Ways to Manage Your Windows Libraries 2 Tools and Ways to Manage Your Windows Libraries Microsoft has made some aspects of managing Windows libraries rather difficult -- what if you want to add removable drives or network shares to a library? What if you want to choose a custom icon... Read More . Your Downloads folder can also be moved to your SD card. To do this, simply right-click the Downloads folder in the File Explorer window and select Properties. Click the Location tab and specify a location on the SD card for the Downloads folder. Whenever a program downloads something to your downloads folder, it will be stored in the Downloads folder on your SD card instead. In the final version of Windows 8.1, your SkyDrive folder can also be stored on an SD card. SkyDrive uses “smart files” to save space How To Keep Your Files Synced With SkyDrive In Windows 8.1 How To Keep Your Files Synced With SkyDrive In Windows 8.1 Storing data remotely and syncing them across devices has never been so easy, especially if you're using Windows 8.1. SkyDrive received a significant update, improving its integration with Windows and adding interesting new features. Read More , but it can still use quite a bit of space if you choose to download files for offline use. Move the SkyDrive folder to an SD card and you can free up space on your system drive. This is as simple as moving your downloads folder. Just right-click the SkyDrive folder in the File Explorer window, select Properties, select the Location tab, and choose a new location for it. This entire process demonstrates the evolution of Windows from a desktop operating system to one designed with mobile devices in mind. Windows 8 had poor support for SD cards, requiring tricks to add them to libraries. Windows 8.1 offers improved support for SD cards with an option in the PC settings app, but many other settings still require drilling down to the desktop — even if you’re using a small, 8-inch Windows tablet. Have you set up Windows 8.1 to work with an SD card? Did you use any other tricks we didn’t mention here? Leave a comment and share them! Explore more about: Memory Card, Windows 8. Can i use an sd card on my laptop where i can store my temp files ( %temp% and TMP )?. I would like to buy an SSD as replacement for my HDD. Or there are some teche things that i need to configure before it works?. any help will do.. Thanks. Note: I only have 1 HDD drive slot. I may be late for this thread but I'd appreciate it if you could help. I definitely have a storage management issue with my Dell Venue 8 Pro tablet running Windows 8.1. I was able to do most of the great changes indicated in this article except for Skydrive. The Location tab will not appear when I right-click the folder icon. Any suggestions? Thanks in advance. What happens if I remove the SD card to use a temporary SD card and then put the storage SD card back? Will it affect programs line Skydrive abd Google Drive? I am using a faster method to use the SD card for storing the user personal files (libraries). Replace the value of entry ProfilesDirectory (%SystemDrive%Users) with D:Users (instead of D: use the drive letter for your SD card). Make sure you format your SD card as NTFS, so you can store files larger than 4 GB on it. An excellent comment. Does this method resolve the issue with Windows updates you describe also on this blog? Also, can you give me a little more detail on finding the installer folder and creating a hard link. i have done the same thing on my vivotab note 8, and it works fine (and i had no issues with windows update). we can easly convert the sd card to ntfs using cmd and the "convert" command (for details: https://support.microsoft.com/en-us/kb/307881). would be natively created on the sd card. I cant seem to download movies from my HP Stream 11 onto my SD card even though i have followed all your steps. Can you help me? Will i be able to do this with a USB flash drive as that is all i have. The problem with Windows on tablets with 32 - 64 GB of SSD memory are not the user personal data files, but the WindowsInstaller folder. At the beginning, even after installing all applications you ever intend to use on the tablet, the Installer folder size is under 2 GB. However, all the Windows updates, which are in most cases several times per week, backup the files which they replace in the Windows Installer folder. Thus, this folder grew on my 32 GB Dell Venue 8 Pro from 1.84 GB (after I had all my applications base installed) to 7.77 GB today. Even though I backed up and removed the original 5 GB recovery partition, the Installer folder swallowed it all and all the rest of the available space. All these extra 6 GB are used by back ups of the files replaced by the continuous updates, which are no longer necessary, except in the unlikely and rare event when one of the updates needs to be uninstalled. The only solution is to move this Installer folder on a SD card and create a hard link to the new location. That way it will still keep growing, eating your SD card space (purchased by spending your money), but you will stop getting messages about Windows having little space left on C:. I wonder what is in Microsoft mind when they treat a tablet with 32-64 GB of total space, the same way as a desktop computer with hundreds or thousands of available GB of hard disc?!! I have a Dell Venue 11 Pro 4/64 atom with a 64GB SanDisk Ultra MicroSD. This did not work with exFat. Format the micros to NTFS and use the 'Default save locations ' in PC settings and boom, 3 new folder/libraries on my microSD card..
Would the techniques listed above work for trying to use my SD as my Dropbox folder. I made a big mistake and got the Surface Pro with just the 64GB drive and there was very little space on it. ended up with both folders containing content; i.e. - it didn't move content, it copied it. makes the folders, but pictures taken with internal camera don't show up on the SD card folders. if i have to drag and drop, whats the point? Good info, Chris. One question: how is this different from the method outlined on this site: http://southpawprints.wordpress.com/2013/02/20/surface-pro-windows-8-and-a-micro-sd-card. The procedure outlined by the "southpawprints" webpage pertains to Win8, as it predates 8.1, but it should work on 8.1, too. His method uses Disk Management to make Windows see the removable SD card as a permanent drive and basically expands the total drive space. The 8.1 method you outline seems to increase storage by telling Windows to use the SD space for library data storage. What are the advantages or disadvantages to his method vs. your method? They're both equally as easy to do. Again, thanks for a terrific, clear article. All of the question can be easily answered. The following does not apply to APPS as I have not worked on that yet. How about installing games from window stores to microSD for window 8.1? I would really like an answer to this question too. With SkyDrive, I don't have as much need to change the default location for documents and pics, but I do need extra storage space for Apps and I am very disappointed in Microsoft for not making that easier. 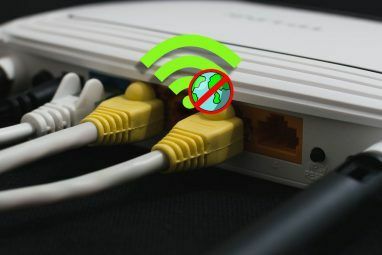 Knowing that storage space is limited on mobile devices, and many of them have SD card slots to help address that issue, it seems rather short-sighted of them to not have considered making moving the default Apps location. Especially considering that Windows 8 was supposedly designed with mobile devices in mind. BIG fail, Microsoft. This doesn't actually work as you outline. I spent over two hours with a Dell tech on my Venue 8 Pro who finally told me this. Selecting Default Save Locations /Set Up simply gives you a message to "connect a Removable Drive and Try Again". Even though the SDXCI card is in place and formatted. He said this is a Windows 8.1 issue that they are going to have to research with Microsoft. The SDXC card has to be formatted in exFAT. The Dell technician said it should be formatted as NFTS. I also am running a Dell Venue 8 Pro and am setting up a microSD (64gb) as the SkyDrive sync folder. The Dell will not allow the SkyDrive folder to be moved to a non-NFTS location. I am in process of reformatting in the hopes that this will work. 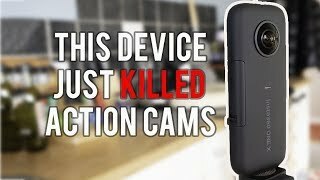 Is there a way to get the camera on the tablet to auto save files to the SD card? I've changed the default save location under PC settings, but new photos and videos are still saving to the camera roll on the device's SSD. Thanks for the feedback - I've looked at the desktop control panel, but unless I've missed something, the Mail configuration is just for Outlook, not the Windows 8.1 modern ui mail application. More generally, I guess what I am looking for is equivalent to the MoveToSD function that a lot of Android apps support. Maybe, It'll be supported in 8.2! My Windows 8.1 is installed on an internal 128GB SSD. I've already changed library locations to point at an external HD. What I'd really like to be able to do is change the default data storage location for Windows 8.1 apps, such as Mail. For instance, I use the Mail app a lot, and it is steadily eating into my SSD. Is this possible with Windows 8.1? Yes. Go to the "real" Control Panel, select "Mail" and make the change. I can't see why anyone would want to do this. What is the point? I moved static files such as videos and photos to SD cards a few months ago. My living room PC is mostly consumed by my mp3 collection on the D: drive, and the C: drive, being small, needed some breathing room as it was frequently reporting low storage space. This is very useful if you have a windows 8 tablet like the surface pro. Having only the essentials on the ssd and then everything else on the SD card is great. Great write up. If you have a Surface like I do its really useful to be able to move stuff off the main SSD and onto a memory card. Even with 256 GB my Surface is filling up quickly and the MicroSD is a very very portable way to keep extra data with me on the go and not having to resort to carrying around an external portable HD. Probably not so important to those with laptop and desktops but a great write up for tablet users. I am confused on the part about previous versions requiring 3rd party tools to make other folders libraries because I have done it on Windows 7 without problems using the base system. Otherwise I love the article. It has really good and clear information. I was expecting you to talk about ReadyBoost. Would using a SD card as readyBoost (if 8.1 has that option) make it faster? This is really about storage, and in most cases you would be much better off using your SD card to store data than trying to improve performance.